The following discourse is attributed to Siddhartha Gautama, later called the Buddha Shakyamuni (the holy sage of the Shakya clan), passed on by word of mouth throughout the centuries from around 500 BC until the second century AD, when it was written down by Nagarjuna. Hui-neng, the sixth Patriarch of Ch'an, identified Nagarjuna as being about halfway in the line of dharma-succession from Siddhartha to Bodhidharma, who carried the Great Jewel from India to China. I first read the Diamond Sutra in the A.F. Price and Wong Mou-Lam translation (see Sources and Links page), and I found that the stylistic conventions interfered with my absorbing the message, so I reworded it into a simplified form that was easier for me to read and consider. 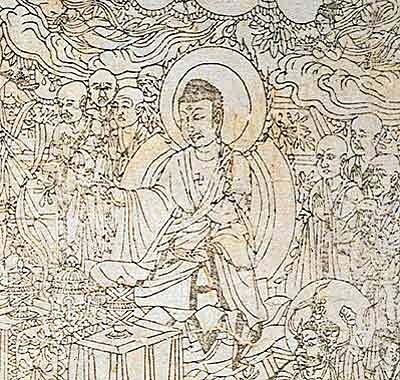 I'm including my version here in hopes that it might be a useful introduction if you're not already familiar with the sutra. In Jeta Grove, the park of Anatha-pindika near the once-great city Shravasti, the "city of wonders" in northern India close to the border of Nepal, twelve hundred and fifty wandering mendicants broke their fast then gathered round to hear the words of the Buddha. The disciple Subhuti arose and, raising his hands with palms joined in respect, said: World-Honored One, if good men and women seek enlightenment, how should they then conduct themselves? They should discipline their thoughts as follows, Buddha replied. All living creatures are caused by me to attain unbounded liberation. Yet when vast numbers of beings have thus been liberated, in truth no being has been liberated. And why is this? Because no enlightened being cherishes the idea of a separate individuality. Furthermore, the Buddha said, a bodhisattva [aspirant] should practice good acts without regard to appearances, without attachment to sight, sound or any other quality. Thus is merit gained, as Krishna instructed Arjuna in The Song of the Blessed One [Bhagavad Gita], when action is performed with detachment. That's right, Subhuti. Wherever there are material characteristics, there is delusion. But whoever perceives that all characteristics are in fact no-characteristics, perceives Reality. Will there always be men who truly believe after hearing this teaching? Subhuti asked. Twenty-five hundred years after the passing of the Buddha [i.e., circa 2000], men hearing this teaching will have an uprising of pure faith, and the Buddha will recognize them, Siddhartha answered. Yes, he will clearly perceive all those of pure heart. And why is that? It is because such men will not cherish the idea of individuality, of a separate being. Neither will they cherish the idea that things have intrinsic qualities, which includes the idea of an ego or individuality, nor even that things are devoid of intrinsic qualities. For the latter ideas imply the former. My teaching of the dharma, the good law, is like a raft that has carried one safely across a flood. One does not continue the journey carrying the raft upon his head. Thus even the buddha-teaching must be relinquished. Has the Buddha attained enlightenment, Subhuti? Has he a teaching to enunciate? As I understand Buddha's meaning there is no formulation of truth called enlightenment, he answered. Moreover there is no teaching to enunciate. The Buddha has said that truth is uncontainable and inexpressible. It neither is nor is not. This unformulated principle is the foundation of the different systems of all true sages, Subhuti. If anyone filled three thousand galaxies with all the treasures of the universe and gave it all away in alms, would he gain great merit? Buddha asked. On the other hand, Buddha said, if anyone received and retained even four lines of this discourse and taught them to others, his merit would be the greater. From this discourse issue forth all the buddhas and the enlightenment teachings of all the buddhas. Does a venerable one who will never more be reborn as a mortal say to himself, "I obtain the fruit of a nonreturner"? No, World-Honored One. "Nonreturner" is just a name. There is no nonreturning; hence the designation "nonreturner." Does a holy one say to himself, "I have obtained perfect enlightenment"? No, World-Honored One, for that would partake of the idea of an ego or individual self. Claiming spiritual superiority is separative and enhances the illusory personality. Does a buddha set forth any majestic buddha-lands? No, Subhuti answered, because such "setting forth" is not a majestic setting forth but merely a name. Therefore, Buddha said, all bodhisattvas should develop a pure, lucid mind that alights upon nothing whatsoever. If a good man or woman filled three thousand galaxies with all the treasures in the universe as many times over as there are grains of sand in all their great rivers and gave all away in gifts to the needy, would he gain great merit? Nevertheless, if a good man or woman studies this discourse only so far as to receive and retain four lines, and teaches and explains them to others, the consequent merit would be far greater. Furthermore, you should know that wherever this discourse is proclaimed, by even so little as four lines, that place should be venerated by all the realms of sentient beings. How much more is this so in the case of one who is able to receive and retain the whole. Such a one attains the highest and most wonderful truth. By what name should this discourse be known, World-Honored One, and how should we receive and retain it? It should be known as the Diamond Cutter of Perfect Wisdom. But according to the buddha-teaching, the perfection of transcendental wisdom is not really such, but just the name given to it. Would there be many molecules in three thousand galaxies, Subhuti? The Tathagata [another title for Buddha composed in Chinese of the characters for "thus" and "come"] declares that all these molecules are not really such; they are merely called molecules. Furthermore, a world is not really a world; it is merely called such. If on the one hand a good man or woman sacrifices as many lives as sand grains on the Ganges, and on the other hand anyone receives and retains only four lines of this discourse, and teaches it to others, the merit of the latter will be greater. Upon hearing the discourse Subhuti had an interior realization and was moved to tears. It is a most precious thing, World-Honored One, that you should deliver this supremely profound discourse, he said. Never have I heard such an exposition since my eye of wisdom first opened. If anyone listens to this discourse in faith with a pure, lucid mind, he will thereupon conceive an idea of fundamental reality. Just as you say, Buddha replied. If anyone listens to this discourse and is filled with neither alarm nor awe nor dread, be it known that such a one is of remarkable achievement. The first perfection, the perfection of charity, is not, in fact, the first perfection; it is merely a name. Likewise the perfection of patience is not such. Therefore bodhisattvas should leave behind all phenomenal distinctions and awaken the thought of enlightenment by not allowing the mind to depend upon notions evoked by the sensible world. The mind should be kept independent of any thoughts that arise within it, or it has no sure haven. As bodhisattvas practice charity for the welfare of all living beings, they should do it in this manner. Just as the Tathagata declares that characteristics are not characteristics, so he declares that all living beings are not, in fact, living beings. The Tathagata is he who declares that which is true, he who declares that which is fundamental, he who declares that which is ultimate. The truth to which the Tathagata has attained is neither real nor unreal. If there be good men and women in future ages able to receive, read and recite this discourse in its entirety, the Tathagata will clearly perceive and recognize them by means of his buddha-knowledge; and each one of them will bring immeasurable and incalculable merit to fruition. If on the one hand a good man or woman performs in the morning as many charitable acts of self-denial as the sand grains of the Ganges, and performs as many again in the noonday and as many again in the evening, and continues so doing throughout numberless ages, and, on the other hand, anyone listens to this discourse with heart of faith and without contention, the latter would be the more blessed. But how can any comparison be made with one who writes it down, receives it, retains it, and explains it to others! The full value of this discourse can be neither conceived nor estimated, nor can any limit be set to it. The Tathagata has declared this teaching for the benefit of the initiates of the great way; he has declared it for the benefit of the initiates of the supreme way. If good men and women who receive and retain this discourse are downtrodden, their evil destiny is the inevitable retributive result of sins committed in their past mortal lives. By virtue of their present misfortunes the reacting effects of their past will be thereby worked out, and they will be in a position to attain the consummation of incomparable enlightenment. If I fully detailed the merit gained by good men and women coming to receive, retain, study and recite this discourse, my hearers would be filled with doubt and might become disordered in mind, suspicious and unbelieving. You should know, Subhuti, that the significance of this discourse is beyond conception; likewise the fruit of its rewards is beyond conception. World-Honored One, if good men and women seek enlightenment, how should they abide and how control their thoughts? They must create this resolved attitude of mind, Buddha replied: "I must liberate all living beings; yet when all have been liberated, verily not anyone is liberated." In reality there is no formula that gives rise to the consummation of incomparable enlightenment. Tathagata is a signification implying all formulas. The basis of the Tathagata's attainment of enlightenment is wholly BEYOND; it is neither real nor unreal. If a bodhisattva announces "I will liberate all living creatures," he is not rightly called a bodhisattva. There is really no such condition as bodhisattvaship, because all things are devoid of separate individuality. Bodhisattvas who are truly devoid of any conception of separate selfhood are truthfully called bodhisattvas. If there were as many Ganges rivers as the sand grains of the Ganges and there was a buddha-land for each sand grain in all those rivers, would those buddha-lands be many? However many living beings there are in all those buddha-lands, though they have manifold modes of mind, the Tathagata understands them all. All these are not mind; they are merely called mind. It is impossible to retain past mind, impossible to hold on to present mind, and impossible to grasp future mind. If anyone filled three thousand galaxies with treasure and gave it all away, would he gain great merit? Indeed, World-Honored One, he would gain great merit. If such merit were real, the Tathagata would not have declared it to be great, but because it is without a foundation the Tathagata characterized it as "great". Can the Buddha be perceived by his perfectly formed body? No, World-Honored One. A perfectly formed body is not really such; it is merely called that. Can the Absolute be perceived by means of any phenomenal characteristics [that is, perceptible by the senses]? No, Subhuti replied, because phenomenal characteristics are not really such but are merely called so. If anyone says that the Tathagata sets forth a teaching he really slanders Buddha and is unable to explain what I teach. As to any truth-declaring system, truth is undeclarable; so an "enunciation of truth" is just the name give to it. In future ages, Subhuti asked, will there be men coming to hear a declaration of this teaching who will be inspired with belief? Those to whom you refer are neither living beings nor not-living beings. "Living beings" are not really such; they are just called that. Subhuti asked: In the attainment of enlightenment did the Buddha make no acquisition whatever? Just so, Buddha replied. Through the consummation of incomparable enlightenment I acquired not the least thing. Furthermore, THIS is altogether everywhere, without differentiation or degree. It is straightly attained by freedom from separate selfhood and by cultivating all kinds of goodness. But, though we speak of "goodness," the Tathagata declares that there is no goodness. If one gives the needy a mass of treasures equal in extent to as many mighty Mount Sumerus as there would be in three thousand galaxies, and if another selects even four lines from this discourse upon the perfection of the transcendental wisdom, receiving and retaining them, and clearly expounding them to others, the merit of the latter will be so far greater than that of the former that no conceivable comparison can be made between them. Let no one say the Tathagata cherishes the idea "I must liberate all living beings." In reality there are no living beings to be liberated by the Tathagata. If there were living beings for the Tathagata to liberate, he would partake of the idea of selfhood, personality, ego entity and separate individuality. May the Tathagata be perceived by the thirty-two marks of a great man? Buddha asked. As I understand the meaning of Buddha's words, the Tathagata may not be perceived by the thirty-two marks, Subhuti replied. For he cannot perceive the Absolute. The Tathagata's attainment of enlightenment was not by reason of his perfected form [I believe he's referring to the entire organism, physical and mental, as well as its manifested actions]. On the other hand, do not believe that anyone in whom dawns the consummation of incomparable enlightenment would declare that all manifest standards are ended and extinguished. Such a man does not affirm concerning any formula that it is finally extinguished. If one bodhisattva bestows in charity sufficient treasures to fill as many worlds as there are sand grains in the Ganges, and another, realizing that all things are egoless, attains perfection through patient forbearance, the merit of the latter will far exceed that of the former. What is the saying, World-Honored One, that bodhisattvas are insentient as to rewards of merit? Bodhisattvas who achieve merit should not be fettered with desire for rewards. Thus it is said that the rewards of merit are not received. If anyone should say that the Tathagata comes or goes or sits or reclines, he fails to understand my teaching. Why? Because the Tathagata has neither whence or whither. If a good man or woman ground an infinite number of worlds to dust, would the resulting minute particles be many, Subhuti? Many, indeed! Because if such were really minute particles Buddha would not have spoken of them as minute particles. "Minute particles" is just the name given to them. Also, when the Tathagata speaks of worlds, these are not worlds; for if reality could be predicated of a world it would be a self-existent cosmos, and the Tathagata teaches that there is really no such thing. Words cannot explain the real nature of a cosmos, Buddha agreed. Only common people fettered with desire make use of this arbitrary method. If anyone should say that Buddha declares any conception of egoity, would he understand my teaching? No, Subhuti replied, because the World-Honored One declares that notions of selfhood, personality, entity and separate individuality are erroneous; these terms are merely figures of speech. Those who aspire to the consummation of incomparable enlightenment should recognize and understand all the varieties of things in the same way and cut off the arising of aspects, Buddha said. Someone might fill innumerable worlds with treasure and give all away in gifts of alms, but if any good man or woman awakens the thought of enlightenment and takes even four lines from this discourse, reciting, using, receiving, retaining and spreading them abroad and explaining them for the benefit of others, it will be far more meritorious. In what manner may he explain them to others? By detachment from appearances - abiding in real truth.